In my last blog post, “A Quilt’s Journey Home” I wrote about a family quilt found in a thrift store in Arizona that made it’s way to a museum in Oregon and was written about in one of the leading newspapers in the state. That story and that quilt reconnected a lot of family members as they called each other to talk about the quilt’s story appearing in the paper. One of the unexpected gifts that came from that story was that I was connected on Facebook to a distant cousin whom I’d never met. That connection led to my learning about a book that she recently wrote about her family. It’s called, Veda: A Novel. I purchased the book right away. I usually don’t have more than one book going at a time, but I didn’t want to wait to start reading this so I put the other book I was reading aside and began reading Veda. I couldn’t put it down. So often genealogy is simply an exercise in learning names and vital statistics and you don’t often get to hear actual stories. And when you do…well, you just have to be prepared for the fact that not all the family members you “meet” on the way are going to be all that wonderful. This is the case with my grand uncle. He was Veda’s first husband. I never got to meet Veda. They divorced long before I was born. I did, however, meet my grand uncle, but I only saw him on a few occasions when I was quite young. Reading Veda made me want to shake some sense into this man….made me want to yell at him and tell him to step up and take care of his family….made me cringe that he’s one of the twigs in my family tree! Veda is a story of resilience and impoverishment and religious fervor gone wrong. It’s a story of what happens when poverty and a lack of choices lead a person to make decisions out of necessity rather than desire. It’s a story of a mother who spends her life making sacrifices to provide for her children. Ultimately it’s a story of a mother’s love. Ellen, the author, takes us on this journey using her mother’s voice — interspersed with entries from her father’s numerous diaries. You’ll find yourself feeling frustrated, angry, shocked, sympathetic, helpless, and sometimes overwhelmingly sad. But you also come away amazed at what the human spirit can endure without becoming bitter or giving up. 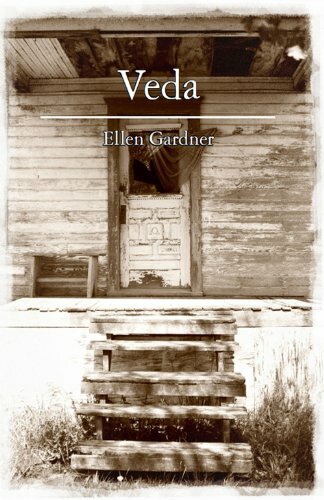 Its beautifully written and though I finished it nearly two weeks ago I still hear Veda’s “voice” in my head….in many ways her story inspires me. I wish I could say the same about my uncle’s. Have you ever read one of those stories about someone finding an heirloom in an antique store or flea market and researching it to help it find its way home? I have. Many times. Little did I know that this past week my family would be on the receiving end of one those lost-heirloom stories. Sunday morning I was visiting my mother when her cousin unexpectedly called and asked if she’d read the morning’s edition of the Statesman Journal (an Oregon newspaper). She doesn’t get that paper so pulled it up online. She excitedly called me and said, “You HAVE to see this.” There on the screen was a photograph of her grandparents and other family members – it was a photo from 1938 taken at her grandparents’ 40th wedding anniversary. My first thought was wondering how did someone get that photo off my family tree on Ancestry. My second thought was wondering why it was in a newspaper article. The reason is a good one. Back in October, someone was working in a thrift shop on a Navajo Indian reservation in Arizona. She was sorting donations when she came across an old quilt. The quilt pattern featured trees with embroidered acorns and names with birth dates. 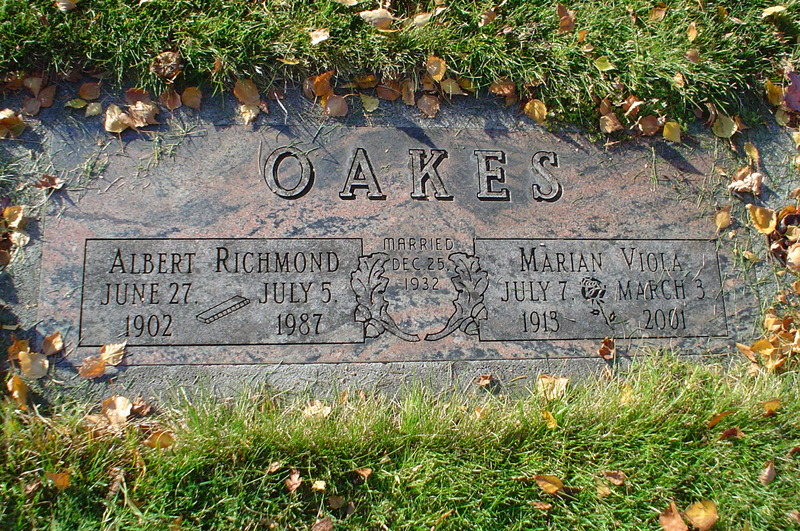 The family name was Oakes. The dates went back to the 1830s. Not wanting someone to use the quilt for a dog bed or just toss it out she set it aside. Later she took it home and started researching the names on the quilt. Discovering that most of the names were connected to Salem, Oregon, she next contacted the Willamette Heritage Center in Salem. The staff member she talked to was intrigued and a few days later the woman in Arizona mailed the quilt to the Center in Salem. Kaylyn F. Mabey, a staff member at the center, continued the research begun by the donor in Arizona. She found an article in a 1938 edition of the Capital Journal that recorded the 40th anniversary of Albert & Pearl Oakes. The aforementioned picture accompanied that article. The names identified in the picture corresponded to the names on the quilt. Kaylyn did some additional research to confirm dates and names, and on Sunday, March 19, 2017 published her findings along with the Oakes’ family picture and a picture of the mystery quilt. The photo of the quilt in the paper featured the name of Mildred M Oakes – she just happens to be my maternal grandmother. This event turned out to be a great opportunity for cousins far and wide to call each other – cousins spread out from Alaska to North Carolina. On Monday morning I met up with my mom’s cousin at the Willamette Heritage Center and he asked if we could see the quilt. Even though we hadn’t called ahead (we were so excited it didn’t really occur to us), they graciously took time to find a room where we could examine the family treasure. To be honest, we don’t even know who made it. Quite possibly Pearl herself did. She had made other quilts in her lifetime but no one knows if she embroidered or not. Maybe others contributed to it. Maybe a friend or daughter-in-law made it. We suspect it was done just a few years before the 40th anniversary – maybe even in anticipation of the anniversary. We don’t know and probably never will. We also don’t know how it ended up in a Navajo Indian reservation thrift store either – though we have some suspicions. The important thing – the really important thing – is that it is in a safe place now – and back in Oregon. It won’t serve as a dog bed or be lost in a trash heap. The hours and hours of work spent creating it – the names memorialized on it will not be lost to history. They are in a museum where members of our family – current and future generations – and museum visitors will be able see it for years to come. Our family is grateful to the kind person in Arizona who recognized the quilt’s value and the time and effort she spent researching it and helping it find its way back to Oregon. And we’re grateful to Kaylyn and the Willamette Heritage Center for the research, for accepting the quilt into their collection — and for publishing the story so our family could read about it and reconnect with it and each other. The full story is available here in the Statesman Journal — Heritage: Quilt with Salem connection shows up in Arizona. Few things in life evoke fond memories of childhood and family the way a favorite family recipe does. For me that favorite family dish is pasty (pronounced “pass” + “tee”). This food is most often associated with Cornwall, England – although it’s history can be traced back much further. It’s considered the national food of Cornwall and since 2011 has Protected Geographical Indication status in Europe (that’s right – the EU takes time to give protected status to regional foods). In its traditional form it can best be described as a big, plump turnover filled with meat and vegetables. Most often its filled with beef (some say venison was used before beef), chipped potato, chipped rutabaga, onion, salt & pepper. This was a popular meal with the tin miners of Cornwall. The turnover could easily fit into the miners’ pockets where it usually stayed warm until eaten for lunch. Some mines were known to have ovens on the premises and miners would carve their initials into their pasty for easy identification at meal time. In the 1840s many miners from Cornwall immigrated to the United States and found their way to the Upper Peninsula area of Michigan where mineral mines were just beginning to be developed. With the immigrants came the pasty and it is is still a popular food in this region of Michigan. Finnish and Italian immigrants soon settled in the area as well and they tried their own variations of the Cornish pasty making modifications such as adding carrots – an addition that provoked no small amount of controversy! My Pollard ancestors were miners who immigrated from Cornwall, England to Iron Mountain, Michigan. Happily they were pasty makers. In a move that has probably made more than a few of my Cornish ancestors roll over in their grave, my great aunt — Elizabeth Pollard Mills — decided to expand the idea of the crescent-shaped pasty and she started making it as a deep-dish pie. This format makes serving it to large groups of people much easier. I’ve added my own variation over the years – instead of chipping the rutabaga (those things are hard as rocks) – I run it through the food processor and shred it (hey, it tastes the same right?). Crust for a two-crust pie (I use the recipe in the Betty Crocker cookbook). Cover the bottom of the pie crust with a layer of rutabaga (chipped or shredded) – next add a layer of chipped potatoes (its sacrilege not to chip the potatoes) — salt & pepper to taste — next add a layer of chopped onions – then add a layer of ground beef. Repeat. Add a few dollops of butter. Cover with crust. Put aluminum foil around the edges to keep it from burning. Bake at 350-375 for about an hour or longer – until the potatoes are done. Now – there is one more thing the last couple generations of my family have added that I’m fairly confident no self-respecting Cornish ancestor would even consider. That’s right – after it comes out of the oven we add Heinz ketchup! I must have Heinz Ketchup on my pasty!!!! This is my comfort food. This is what takes me back to my childhood and extended family gathered ’round the table for the holidays. Pasty. Just thinking about it makes me smile….and makes me hungry! Pictured: Elsie Victoria Henrietta (Mattson) Pollard (wife of Alexander Pollard) holding Alice Pollard (married Ernest Mulkey), next to her is Elizabeth Pollard (married Alvis Mills) and Bernice Pollard (married Adrian Jacobs) at their home in Iron Mountain, Michigan. Oh my – it has been such a long time since I published a bog post! Once you get away from it getting started again is painfully hard. Especially when my genealogy work these past few months has been so hit and miss. Life gets in the way of hobbies sometimes. Anyway, to get back into it a bit I wanted to share some fun genealogy-related finds that I’ve come across in the last few weeks. One of my absolute favorites is the Facebook page EBay Genealogy. On this page if you find family pictures, Bibles, documents, etc on places like Ebay, Goodwill auctions, Etsy, or in antique shops you can post the find on this page and help families reconnect with lost heirlooms. Another new Facebook page that I just discovered is We Are Genealogy Bloggers. This site is just getting started but already has 191 members as of this writing. Fellow bloggers share their tips and hints, ask questions, and sometimes share helpful individual blog posts. If you’re interested in Rhode Island genealogy, Diane Boumenot is starting an eight-part series on her blog, One Rhode Island Family. The series will be a wealth of information on researching Rhode Island ancestors – complete with web links. I’m looking forward to it. Lately I’ve read a lot of blogs and articles that extol the virtues and emphasize the necessity of doing timelines. To be honest, I just didn’t think they were that necessary or helpful — but that was because I’d never done one! I felt (apparently overly) confident that since Ancestry.com tended to list facts in order that if I just glanced through their timelines I wouldn’t need to do my own. Au contraire! I just created my first two timelines for one set of confusing great great grandparents. (For this post I think it best to keep names out of it.) By creating a timeline I not only sorted out their rather confusing chronology of life events, but also discovered some facts that had not been readily apparent before doing this exercise. The primary reason for my setting about to create these timelines was needing to sort out the birth of the great great grandparents’ youngest child. 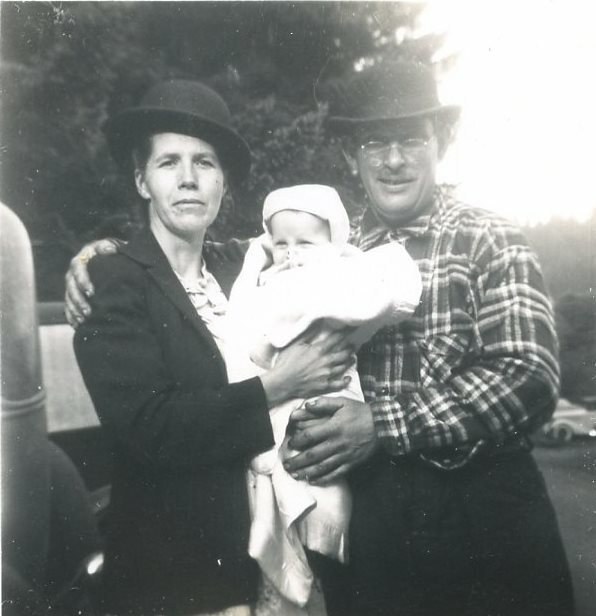 From all outward appearances – relying mainly on censuses – it appeared that my great great grandfather had left his family in Minnesota and moved to Washington – seemingly leaving my great great grandmother and their children alone to fend for themselves. Then I noticed that his youngest daughter was born well after he’d “disappeared” from their lives and moved to Washington. By creating timelines for each of them I discovered that his wife had in fact followed him to Washington – via South Dakota – and that their youngest child was actually born in Washington (and not South Dakota as reported on one of the census). While many questions remain that I have yet to unravel….at least I can follow their trail better by having created this timeline. I learned something else while working on their timeline. I learned that their oldest son was born a full two years before they were married. His mother was only 17 at the time. When the couple did marry they lived with her parents. It appears to be a safe assumption that they let their daughter and grandson live with them before the marriage rather than turning them out. Interestingly, I discovered that the obituary for my great great grandmother that was published in a church magazine indicated that the marriage took place the year before the son was born. Since that information was provided to the church by a family member, I can’t help but wonder if the story passed down through the years was that the marriage took place before the child’s birth to legitimize him in the eyes of the family and the church. Timelines certainly helped paint a clearer picture of the events in my great great grandparents’ lives. I may have eventually put all this together using other forms of analysis or observation – but the timelines made this process much easier and were well worth the time and effort. I’m now anxious to create these for other members of my tree — and I too can extol their virtues to others who wonder if they are a necessary part of genealogical research. What I’ve Learned About Blogging — So Far…. 1. Starting a blog in the summer is a bad idea. This is a project best started in the midst of a cold/wet/rainy winter. 2. Trying to find things to blog about that anyone other than myself (and maybe a few family members) would be interested in reading is incredibly intimidating. 3. Once you get side tracked and take a break from blogging it is EXTREMELY hard to get started again. That’s it….so far. I’m still really new at this so I’ll have a lot more to learn as I go along. But I had to pick this back up and start somewhere. Guess these brief observations were as good a place as any. Hoping to do something of more substance in the very near future! Addendum: Apparently #4 would be to not blog late at night because my editing skills are far worse then (which would explain why this was posted with the title “What I’ve Learning About Blogging — So Far…..). And to think I edit for a living….sigh….! 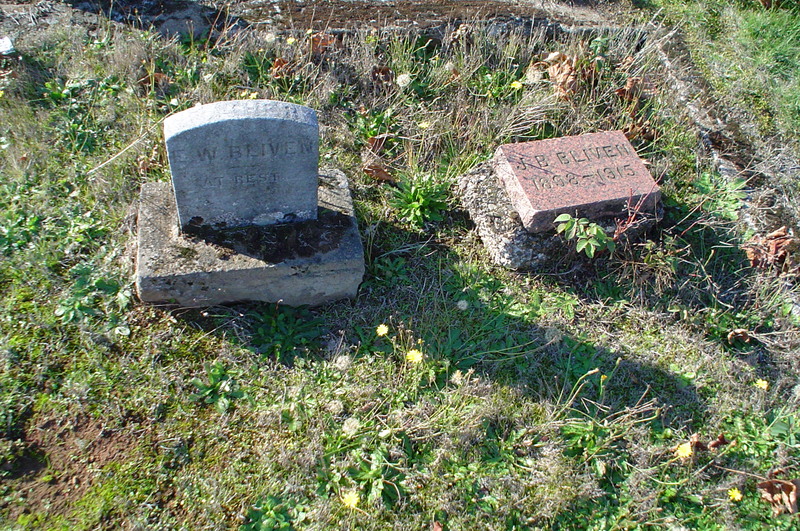 Here are some headstones from City View Cemetery in Salem, Oregon. 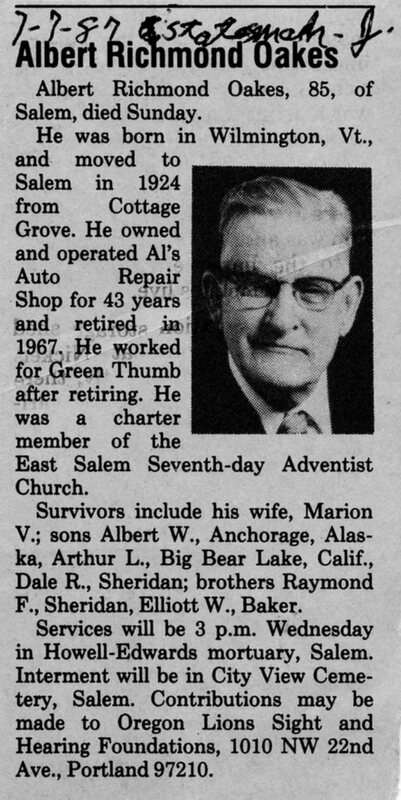 Albert Oakes and Gordon Oakes are grand uncles in my family tree. If any of these pictures help you in your research please feel free to use them. 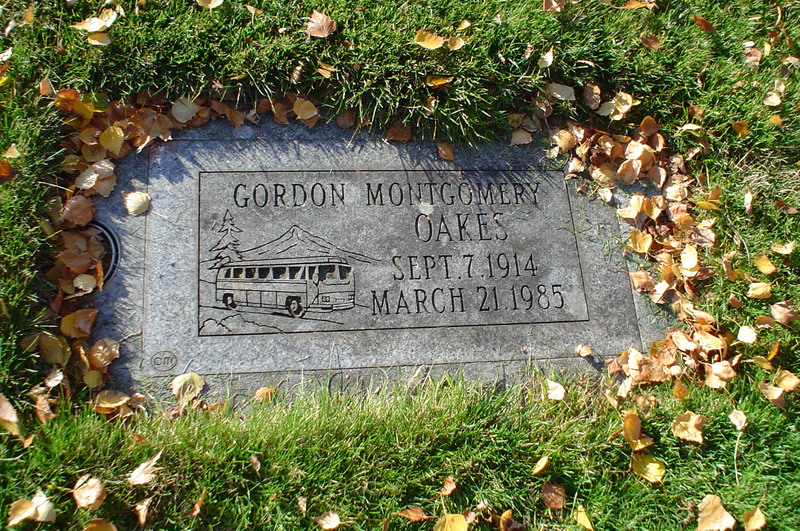 The bus is engraved on the headstone to acknowledge the many years that Gordon spent driving for Greyhound. I’m pretty sure that anyone who’s been working on their genealogy for any length of time will shake their heads in disbelief when I say that after five years of researching my family I just now requested my first real document. Until a few weeks ago I relied exclusively on images and information that I could access on the internet. And that’s gotten me a long ways – but this story just begged for real documentation that I could see with my own eyes. The story handed down over the years was that my grandfather and his twin brother were named Roy and Ray – and that they were named after the doctor that delivered them. Apparently he was named Ray Roy (or Roy Ray). That’s the story. And as with my own last name (see Thursday’s post, “I’m Not Who I Think I Am”), I had no reason to doubt that my grandfather’s name was Roy. Apparently my grandfather and his brother were named “Alpha” and “Omega” – NOT Roy and Ray. I’m not sure why they would have been given these names. Perhaps giving birth to twins in 1913 was so difficult that my great grandmother was letting everyone know that these would be the first and the last children she would be giving birth to. Maybe it was religious zeal. There’s no one alive to fill in the missing information on this story. Finding this all a bit shocking I decided to order the actual birth certificate. Seemed like if I was ever going to start ordering actual documentation for my research this would be a great one to start with. I kinda had my doubts that Alpha and Omega would be the two names that would actually appear on the certificate(s) – but sure enough, when it arrived in the mail a couple weeks ago those were indeed the names that were recorded for the twin boys. In 1962 my great uncle Ray amended the certificate (only one was issued for both boys) and had his name changed to Ray officially. There’s no record that my grandfather ever followed suit. Apparently he never had reason to have to produce his birth certificate to prove who he was. As with most of my research to date I’m simply left with more questions than answers. When and how did their names get changed? Did they always know about their original names? If not, when and how did they learn about them? Why did one make an official change and not the other? How come no one kept detailed diaries to answer all my questions two generations later? Oh, and as for the doctor that delivered them being named “Roy Ray” (or “Ray Roy”) – not so much. Turns out it was an “O. F. Heisley” – so even that part of the story fell apart. If genealogy is the art of solving family mysteries, I’m afraid I’m creating more than I’m solving! Not long after beginning my foray into genealogy four or five years ago, I discovered the wonder that is Findagrave.com. I LOVE that site. I was so excited finding headstones (and other important info) and I eagerly (and apparently thoughtlessly) attached them to my family tree. Traveling to cemeteries around the country is impossible for most of us and so I have been (and continue to be) most appreciative of those who graciously take these pictures and post them for us to see. While I have always given credit to the photographer when I attached a headstone photo to my tree (including links to the original site), I never thought I needed to do much more than that since these pictures are on a free website. I should have known better. Although most of the people who post headstone pictures on that site are more than generous and happy to let us use the photos in our research, sadly there are others who get angry — really angry — at the thought of anyone using the photos in our trees. This is so unfortunate. Its like you can go and look but you can’t touch. I’d love for there to be a site like Findagrave where people post headstone pictures that can be freely shared without all these copyright issues. It seems like the real value in such a site is letting people use the photos in their research — on their trees. Having a picture of a headstone is often the only visual image we’ll have to associate with names that are too far back in history to ever put a face with. Unfortunately I do not have the technological knowledge necessary to start a site that would allow this free exchange of pictures — one in which people who post their pictures would do so with the knowledge (and intent) that the pictures were there for anyone to use for their personal use in their research. I can, however, post a few here every week and share them with anyone who might find them useful. 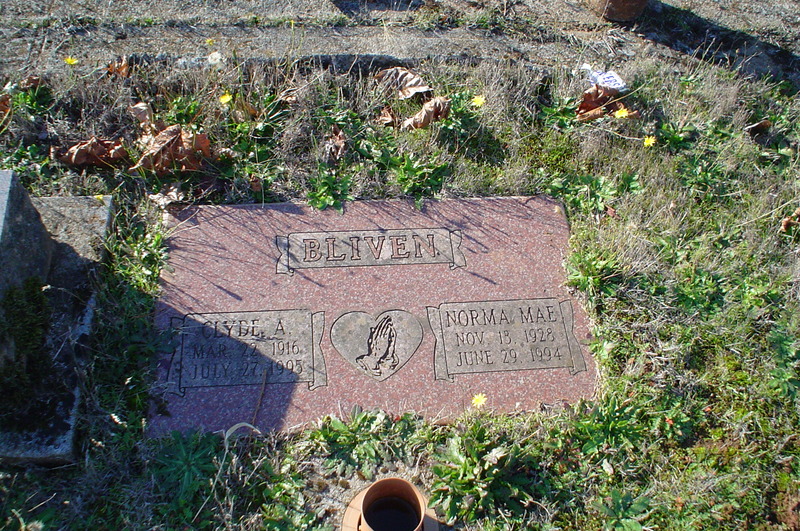 They are not always headstones from my family – though they may be similar surnames. Sometimes I took headstone pictures in case I someday connected the names to my family – sometimes just because a headstone looked interesting. So, that’s my little soapbox. I can only do this on a small scale – but please, if any of the headstone pictures I post on this site can be of help in your research, feel free to use them. And now, without further ado, here are this weeks’ selections. 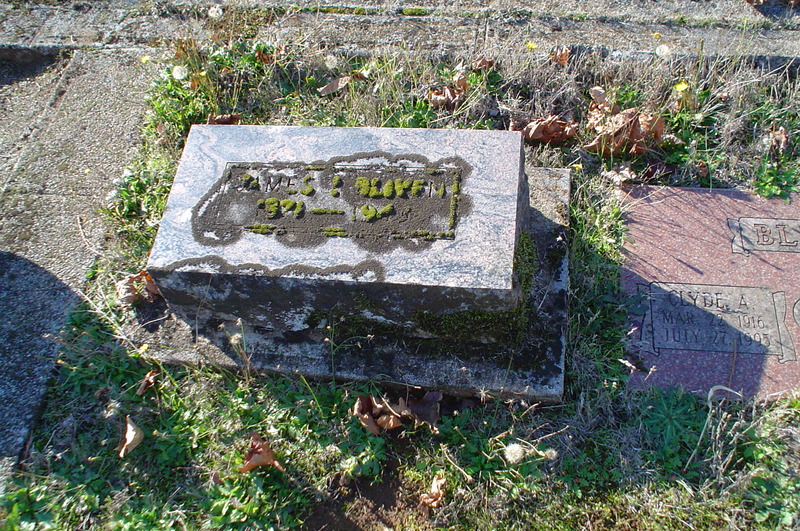 All headstones are located in City View Cemetery in Salem, Oregon. These photos were taken in 2007. Until a year or so ago I had spent my whole life comfortable in the knowledge that my last name was Jacobs — that my father’s last name was Jacobs, as was his father’s, and conceivably many generations before that were in fact a long line of men bearing the last name of Jacobs. I had no reason to doubt this knowledge. Learning that I am not a Jacobs was most decidedly NOT something I anticipated happening when I started working on my genealogy. My interest in learning about my family can be directly attributed to a distant cousin, Clarence Jacobs. Clarence and his son, Steve, have been working on the Jacobs’ family tree for well over 40 years. And they’ve done most of it without the aid of the internet. Clarence has written a huge book – a good six-inches high – hand-typed on a manual typewriter – chronicling the history of the Jacobs family. Clarence typed up a brief version of this history and presented it to my father many, many years ago. Thankfully my dad left it to me. And about four years ago I delved into it in earnest and caught the genealogy bug. 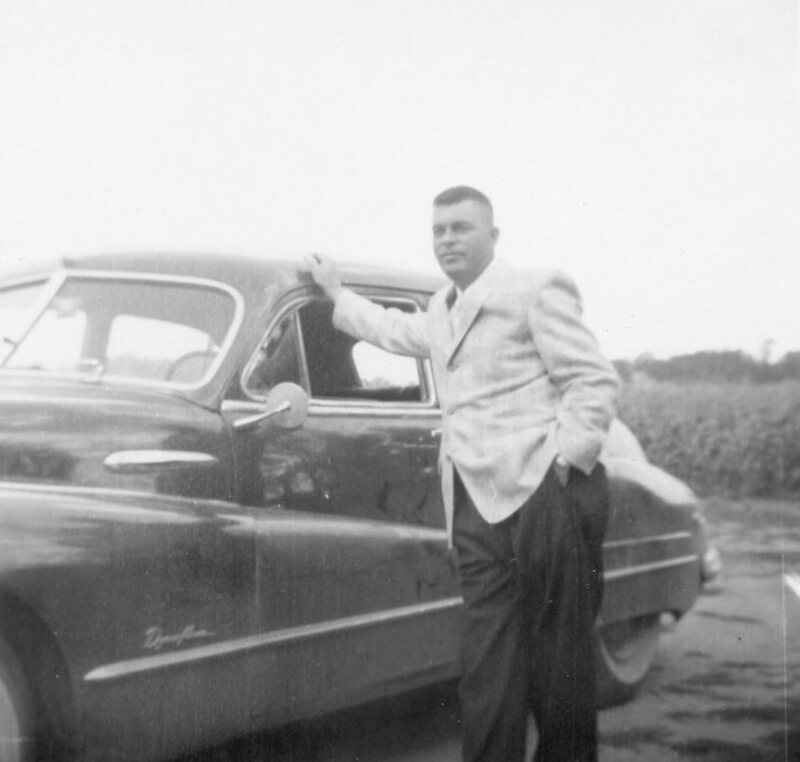 This 40+ years of work that Clarence and Steve have done has resulted in a tremendous amount of information being gathered about my family – but always there was this brick wall by the name of John Jacobs, Sr. He is my 5th great grandfather. He is our brick wall. 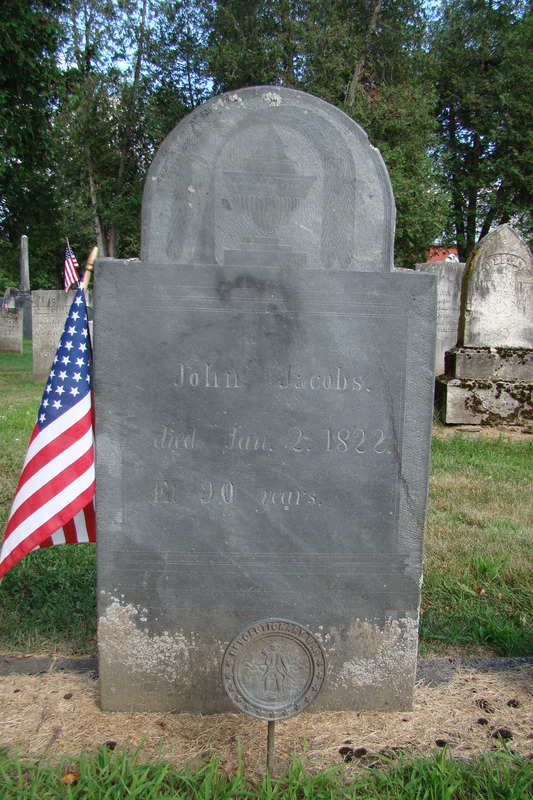 John Jacobs is buried in Chester, Vermont. According to his tombstone he was 90 years old when he died on January 2, 1822. This means he should have been born in 1731. 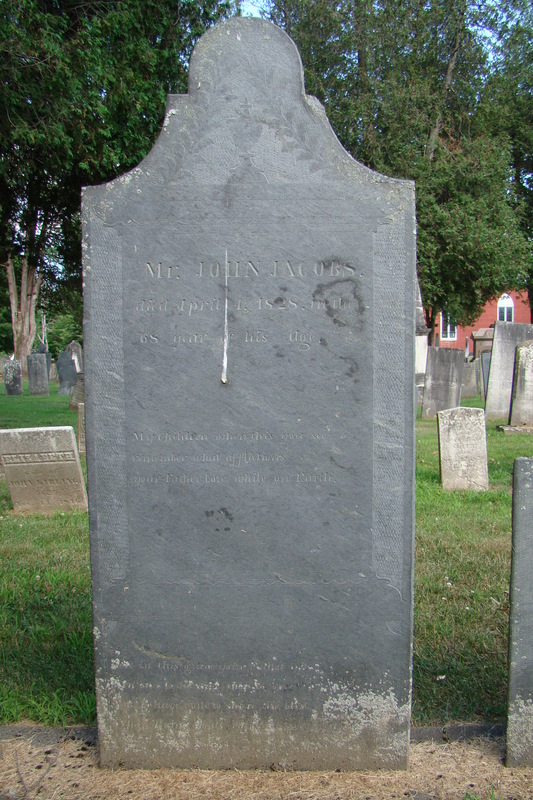 However, most people who’s trees I’ve looked at on Ancestry.com or other online sites have either assumed he was the John Jacobs who was born in 1732 in Hingham, MA, or the John Jacobs born in 1732 in Rehoboth, MA. Either of these would tie our John Jacobs into the Nicholas Jacob line – Nicholas being the first Jacob to have come to this country. Chester Historical Society MMXI, History of Chester, Vermont, 37 (no publication year given). I then researched Emily Jacobs and learned that Emily was born in 1821 in Chester, VT. Her parents are Cyrus & Elizabeth Jacobs. Cyrus is the son of John Jacobs & Hannah Bowker. John is the son of John Jacobs, Sr., buried in Chester, VT, making him Emily’s great grandfather. Thus begging the question: Is John Jacobs, Sr., buried in Chester, Vermont, actually John Jacobs Hover? Could this be why his parentage has been so difficult to trace? As a descendant of John Jacobs, Sr., I and two other descendants have taken DNA tests and have found zero links to the Nicholas Jacob line. In fact, aside from proving Clarence, Steve, and I are cousins, there is no link of any kind to anyone name Jacobs. But there are DNA links to Hoover/Hover surnames. It would seem from this information that I am not a Jacobs – I’m a Hover. And even though we’ve made this possible breakthrough it’s only resulted in a new brick wall. We have no idea who John’s parents were. Making matters more difficult is that the Pennsylvania Dutch had a variety of spellings of the Hover last name – including Hoover and Huber. There are so many questions – such as why did John leave his family? Why did he drop the Hover name? Was family life so bad that he just wanted to escape and start over? Was the religious upbringing overly strict and confining? Was the family situation abusive? Was he just a rebellious young man who wanted to prove he could make it on his own without his family’s help? So many questions – but the most important of these are who was he? Who were his parents? What was his history? No marriage records have ever been found. No record of his wife’s maiden name. His children were all born as Jacobs – in New Hampshire – so at some point it seems he must have left Chester – moved to New Hampshire – and then moved back to Chester. He served in the Revolutionary War as John Jacobs – but no pension records were filed so we can’t find any information through those. We are just at a dead end. Our only hope seems to be for more people to take DNA tests so we can figure out where we fit in the Hover/Hoover/Huber line and maybe one day break down this seemingly indestructible brick wall. 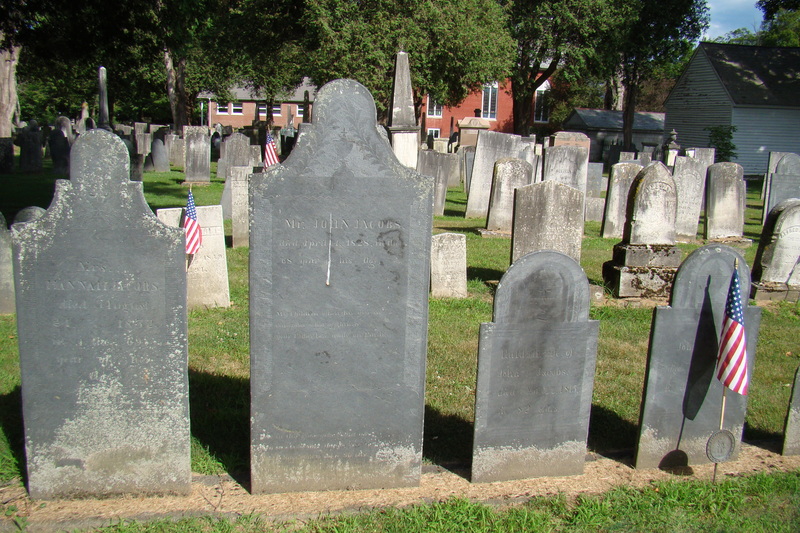 Jacobs’ family plot – Chester, Vermont. An extensive list of helpful websites is available on my "Research Websites" page.